The three great folks on the IPT– Deirdre Sheerr-Gross, Catherine Costolo, and Dr. Dennis Cassidy–all repeat clients, were joined for the day by three BIRDS AS ART newbies. At the end of the day, a gushingly happy, hugging, and smiling Laura Benassi thanked me for the three great sessions and told me that she had never ever learned so much in a single day. 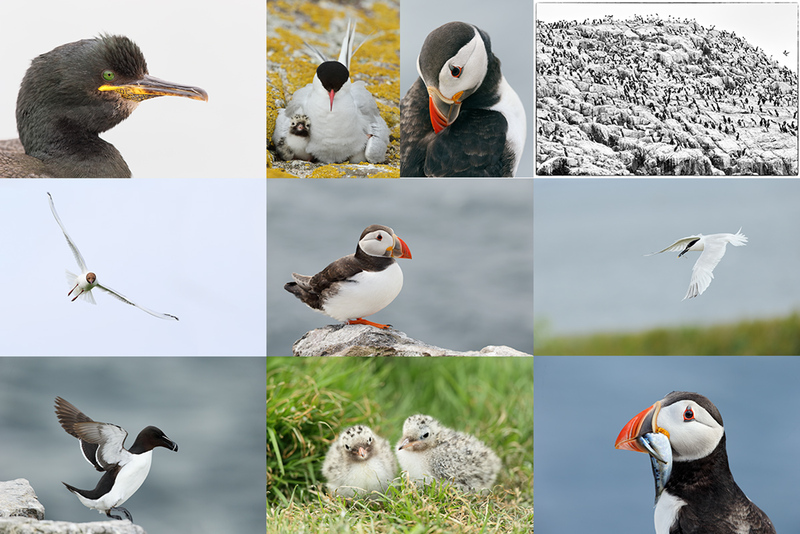 John McCartney and Sharon Young told me that they had been on numerous photo tours all over the world but that nobody had ever bothered to teach them about histograms, about autofocus, about creating sharp images, and about getting close to birds. 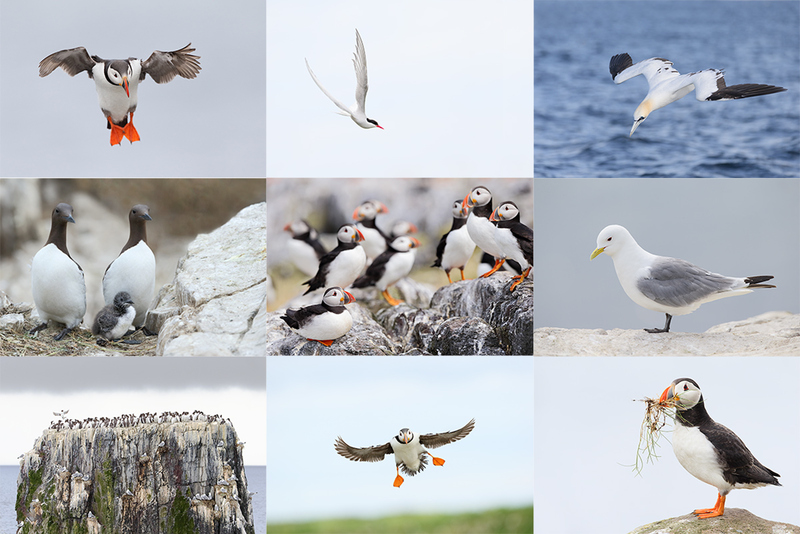 Again, there was no time for meditation or for a swim or for ice baths but there is lots of great bird photography and learning going on. This blog post, the 317th in a row, took me about 2 1/2 hours to prepare. It was published just before 5:30am from my motel room in St. Petersburg Beach, FL. This image was created at 8:39:36am on the morning of 11 October, DAY 2 of the Fort DeSoto October IPT. I used the the hand held Canon EF 200-400mm f/4L IS USM lens with Internal 1.4x Extender (with the internal extender in place at 406mm) and a beta version of the Canon EOS 7D Mark II . ISO 400. Evaluative metering +2/3 stop off the light sky 30 degrees above the horizon: 1/2000 sec. at f/8 in Manual mode. Central sensor/AI Servo Surround/Shutter Button AF missed the bird completely and was active at the moment of exposure but resulted in a sharp image. Please don’t ask me how that works. The tern was flying toward us and then turning a bit to the east into the wind as they looked for the greenbacks below them. Here highly skilled Mr. Famous Bird Photographer completely mis-framed the image. Note: though none of the nine active sensors were anywhere near the bird the image is sharp on the eye. This, the next frame in the sequence was also created at 8:39:36am on the morning of 11 October, DAY 2 of the Fort DeSoto October IPT. With the hand held Canon EF 200-400mm f/4L IS USM lens with Internal 1.4x Extender (with the internal extender in place at 406mm) and a beta version of the Canon EOS 7D Mark II . ISO 400. Evaluative metering +2/3 stop off the light sky 30 degrees above the horizon: 1/2000 sec. at f/8 in Manual mode. Central sensor/AI Servo Surround/Shutter Button AF on the base of the bird’s tail just below the undertail coverts was active at the moment of exposure. This image is sharp on the eye. 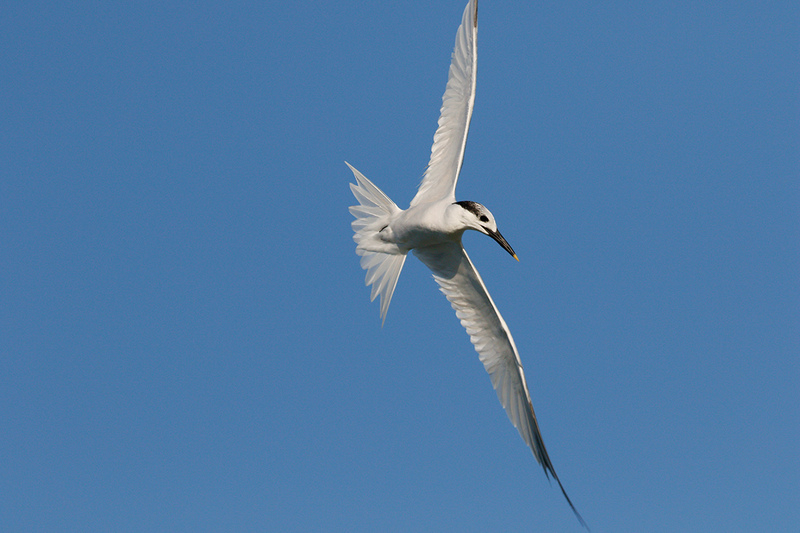 The tern stalled a bit in flight. This let me know that a dive was imminent. Though I had zoomed out a bit between the 1st and 2nd frames in the series, from 212 to 206mm I was still tight enough to clip the the primary tips top and bottom…. Wouldn’t a vertical have been nice? Here highly skilled Mr. Famous Bird Photographer mis-framed the image: the bird is far too centered. Frame 3 in the series: created at 8:39:37am on the morning of 11 October, DAY 2 of the Fort DeSoto October IPT. Also and of course with the hand held Canon EF 200-400mm f/4L IS USM lens with Internal 1.4x Extender (with the internal extender in place at 412mm) and a beta version of the Canon EOS 7D Mark II . ISO 400. Evaluative metering +2/3 stop off the light sky 30 degrees above the horizon: 1/2000 sec. at f/8 in Manual mode. Central sensor/AI Servo Surround/Shutter Button AF; again all nine active sensors missed the bird completely but were active at the moment of exposure. Again, the resulting image was sharp. Again, please don’t ask me how that works. Even though I knew the dive was coming I was not quick enough. Here again highly skilled Mr. Famous Bird Photographer completely mis-framed the image. 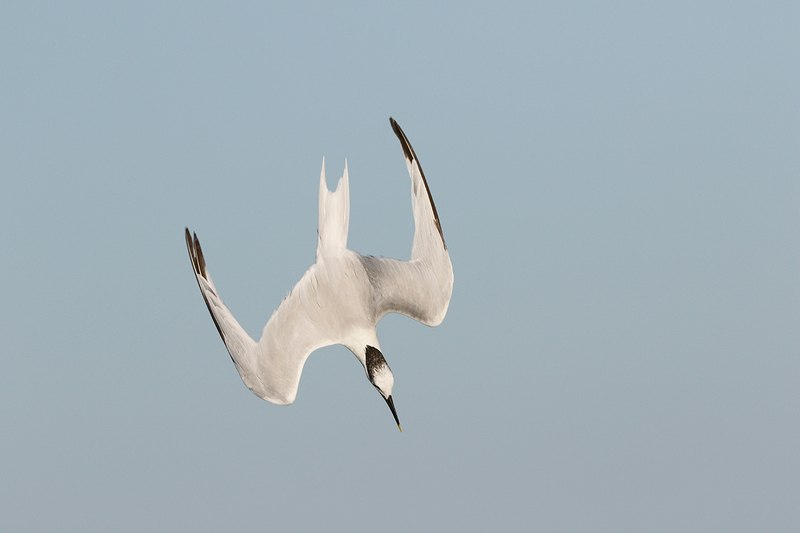 Amazingly, the AF system of the new EOS-7D Mark II continued to track the bird perfectly in flight. This is the last frame in the sequence: 8:39:37am. With the hand held Canon EF 200-400mm f/4L IS USM lens with Internal 1.4x Extender (with the internal extender in place at 406mm) and a beta version of the Canon EOS 7D Mark II . ISO 400. Evaluative metering +2/3 stop off the light sky 30 degrees above the horizon: 1/2000 sec. at f/8 in Manual mode. Central sensor/AI Servo Surround/Shutter Button AF on the trailing edge of the bird’s left was active at the moment of exposure. This image is exceedingly sharp. 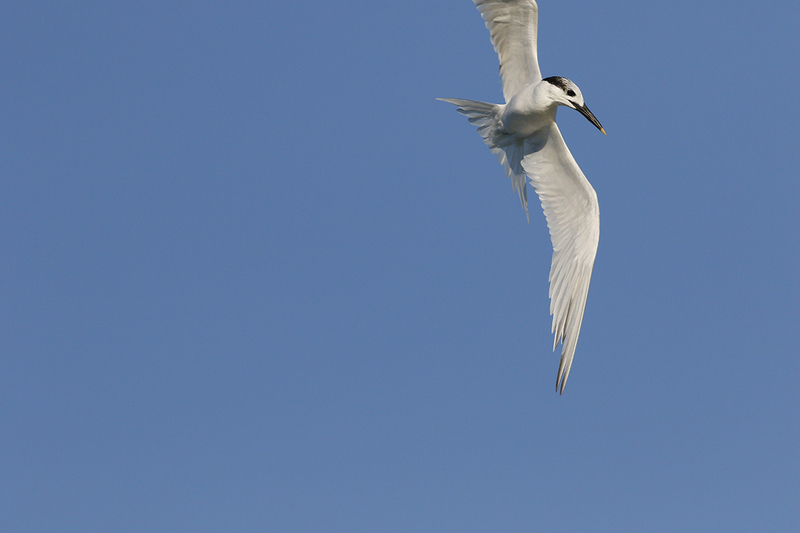 Sandwich Tern Diving/Determination Pays Off! 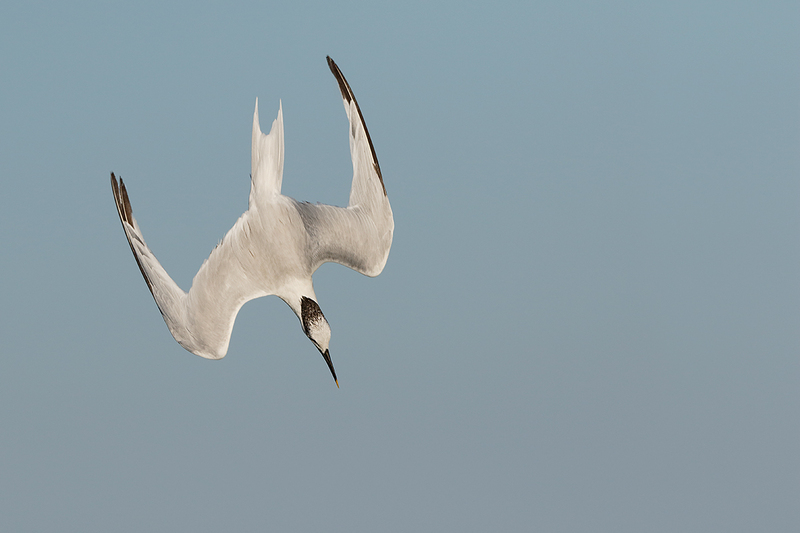 Once he bird started to dive I frantically jerked the camera down in an effort to center it in the frame. I must assume that my rapid downward panning allowed me to catch up with the bird and amazingly, the 7D II AF system continued to track the subject despite my worst efforts :). When I saw the lovely diagonal lines when reviewing the images on the back of the camera I just could not wait till I got home and did something that I rarely do in the field: I zoomed into 100% to check for sharpness. Then I started jumping up and down for joy and began showing the image off to the group. Subdued I am not. Most everything in flight that I shot that morning was sharp on the bird’s eye. 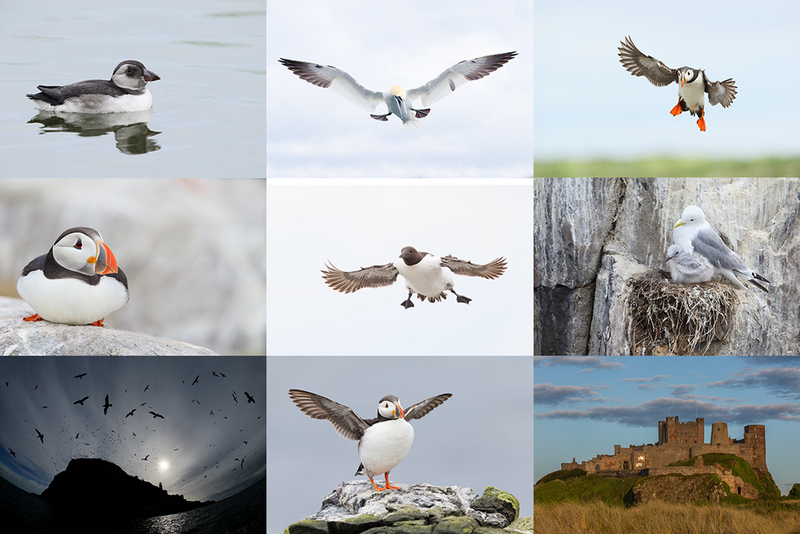 And I did get probably another five or six very excellent flight images. Nothing however came close to this one. Image next is the optimized image. This is the optimized image that was created from the 4th frame of the sequence. The RAW file was of course converted in DPP v3.14.41.0. Though this image would work very well pretty much right out of camera, I wanted to move the bird a bit up and back in the frame. I used techniques from APATATS II to do that in less than a minute. The group was amazed. Then I selected the bird very carefully with the Quick Selection Tool, saved the selection, ran Select Refine Mask, applied a layer of NIK Color EFEX Pro Detail Extractor, reduced the opacity to about 25%, and painted some of the effect away with a Regular Layer Mask. After merging that layer I loaded the saved selection, hit Alt + Ctrl + I to Select Inverse, thus selecting only the sky. I put the sky on its own layer and pulled down the curve (Ctrl + M) to darken the sky just a bit. Then I selected the cap and the bill, again with the Quick Selection Tool, and sharpened that layer only with a Contrast Mask. Thanks, Artie. I have reasonably often had good sharp in-focus images of flying birds when the active sensor on my 7D wasn’t on the bird. But I’ve also had a few bad ones where the active sensor was on the bird. Image 4 is lovely indeed. 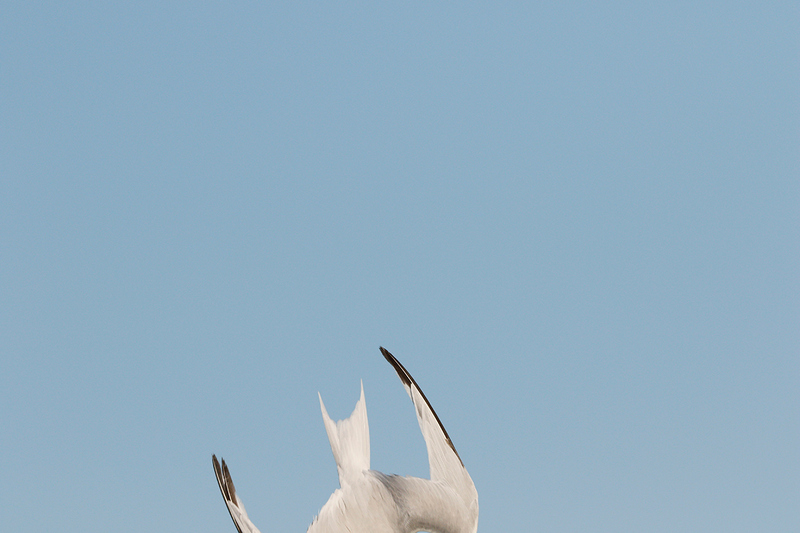 I spent a lot of time this spring trying to get such shots of least terns. Maybe the 7D2 will help me get some keepers. When the sensor is on the subject and the images is out of focus you need to look in the mirror :). Yes, thanks for giving us some insight on the 7d2. One question on the cameras histogram. On the 7d the cameras histogram edges are not very well defined which makes it hard to see how close you come to the edge of the box. Did they solve that in the 7dii ? Thanks again Artie for taking the time to do the 7d II research. YAW Craig. The 7D II has a nice black frame around it that makes it easy to read :). 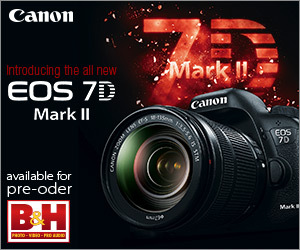 You seem more enamored with the 7D2 than the 1Dx or is this just the bliss of new love? I like the light weight. I live the 1.6 crop factor. I like the price. I love the image quality. The 7D II handles high ISO noise very nicely. What’s not to like? Am I selling my two 1D X bodies? Perhaps. Awesome review so far Art thanks for taking the time to put this all together. Ever since this camera has be announced all people asked about was noise and I don’t see where that has been an issue in any of your images. With the same focus case settings available did you go a head and tweak case 3 tracking sensitive etc or just leave it as it came? I’m really hoping the 7D reacts the same and I can set it up just like my 5DIII that will make it so nice going back and forth between both bodies.